It’s always hard to find decent fish at a good price in my area, and I’m always trying to find ways to work more fish into my diet – thanks to the gentle urging of my brother who’s something of a guru on health and nutrition. (He would tell you, though, to be careful of the omega 6 ratios in Tilapia, and stick with the smaller fish in the ocean.) But for me, just eating fish (What can I say? I grew up in a land locked state in a family that only served Tuna Casserole and Salmon Loaf, and that usually during Advent and Lent.) is a triumph. I’ve noticed a lot of my friends are just picking up the frozen fillets of Tilapia for quick dinners, and decided to follow suit – and was pleasantly surprised. The herb crust kept the thin cut moist and succulent, added a wonderful flavor, crunch and texture, and I could *almost* pretend the Tilapia wasn’t there! How’s that for a fish endorsement! I’m a little chagrined by my somewhat public admission, but I will say if you don’t have fish lovers in your family, maybe the bright, lemony, herby topping will help ease them into submission. And if you do have fish lovers? Well, what’s not to love here? Preheat oven to 375 degrees. Place one rack in the center of the oven and the other about four inches from broiler. Line a baking tray with aluminum foil (optional) and lightly spray with cooking spray. Lay the tilapia fillets out on the tray. 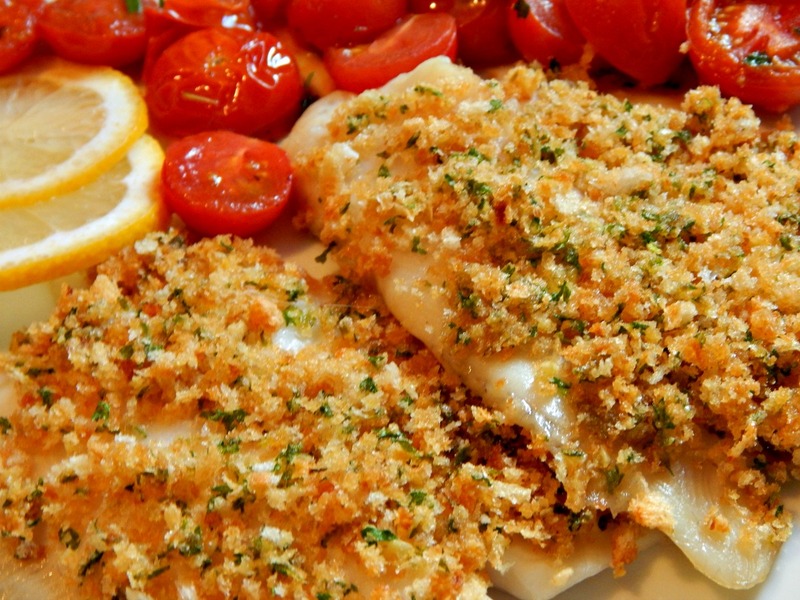 Gently pack the most of the bread crumbs over the tilapia fillets. Lightly sprinkle the rest over the tops. (This makes the crust look a bit more attractive.) Bake at 375 degrees for 10 minutes. If not quite browned, turn on broiler, place fillets on the top rack and brown the crumbs for a moment or two, watching closely. You could certainly do like Tyler Florence did and smear the fish before topping with a mixture of basil and butter. You could try this basic recipe with other fish – even with boneless skinless chicken breast. If you don’t wish to use basil, try this with other herbs or a combination of your favorites. When working with any bread crumb topping, starting out with a toasted bread crumb can help speed along the browning process and is ideal for items that spend short time periods in the oven: Casseroles, boneless chicken breasts and fish are a few things that come to mind. Mixing the crumbs first with Olive Oil (or perhaps butter in certain cases) also helps promote gorgeous browning and crunch and works out so much better than adding crumbs, spraying them with cooking spray and hoping for something that looks and tastes good. Save a bit of the bread crumb topping out, and gently press the crumbs onto the fish or chicken so they adhere. Sprinkle the remaining over the top, and you’ll have a beautiful crust with dimension rather than something that looks flat and contrived and you’ll find it has more crunch than if you had just simply pressed the crumbs on. Gently press on bread crumbs, then lightly sprinkle a few on top. Recipe made June 2012 for a little under three dollars. This entry was posted in Click here for Bargain Meals, Click here for Fabulous Food Posts and tagged Bargain Meal of the Week, breadcrumbs, Easy Recipe, Fish and Seafood, Frugal Hausfrau, Olive oil, Ratatouille, Tilalpia with Crusted Herb Topping, Tyler Florence. Bookmark the permalink.